Kids and dogs just naturally go together. Both are full of energy and life and infinite possibilities. The kids love to create games to play and the family dog is often a more than willing participant. This interaction is beneficial to both parties. The kids learn patience as well as leadership skills when they show the dog what they want him to do. The dog learns how to interact with people. And both learn social skills, thinking skills, and one of the best benefits, they burn off energy while having fun! Just a reminder, parental guidance and oversight is necessary to make sure that the kids do not get too rough, expect too much from the dog or put the dog in danger in any way. Also, the parents should help the kids recognize when a dog is not interested or not able to participate. That being said, here are some fun and easy games that kids can play with their dogs. The “find it” game can be a fun challenge for the dog and the kids. This is where an object, say a toy or treat, is hidden, and the dog is sent to go find it. To start out, have the dog sit and stay. Letting the dog see the object or treat, place it several feet away, then encourage the dog to “find it.” As he gets the idea, start making it a little harder to find each time, making sure that he does find it and “wins.” As a reward for finding it, especially if it is a toy, play for a few minutes with him and the toy. If it is a treat, let him eat it and give him some more. Make sure if giving treats that they are small and easily chewed so as not to distract him or take his attention from the game. This game could easily grow to include having the dog learn the names of various toys and other reasonable objects and finding them when asked to. 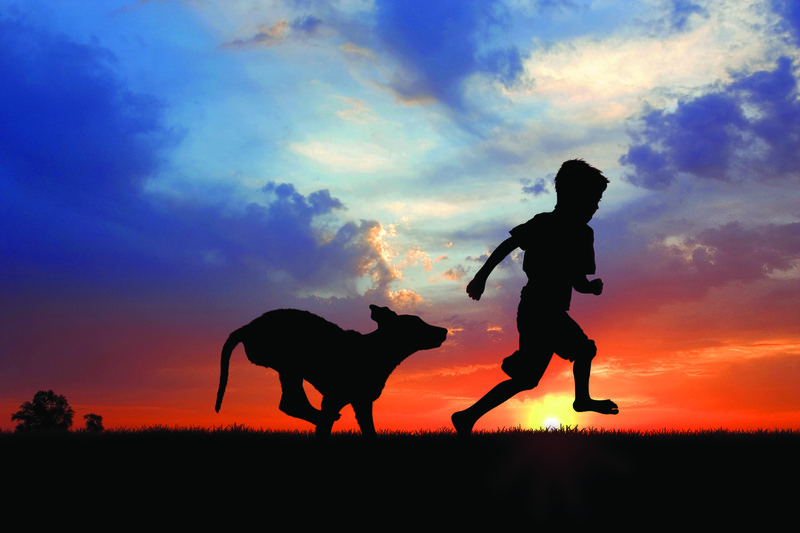 While the family dog may never get close to the 2,000 plus words that Border Collie, Chaser, has accomplished, this can be a fun and challenging game for both the kids and the dog. I would bet that most kids have played “hide and seek” with their dog a few times already. But if not, have someone hold the dog while the kid hides behind door or furniture if inside, or a tree or corner of the house if outside, when the dog is not watching. Have the kid call the dog and make some noise to help the dog find him. As a reward, play tug of war with a rope toy or toss a ball out, depending on whether they are outside or inside and the size of the dog. Small, soft and quickly eaten treats are good too. Start out with short distances and simple hides while the dog learns what is expected of him. As he gets the knack of it, the person hiding can make it a little more difficult by hiding behind closed doors, in a tree, or longer distances. Remember to train to the dog’s level to keep his interest up. Otherwise, if he can’t find the person hiding, he may get frustrated and quit the game. If he can’t seem to find them, go back to simple, then when that is easy for him again, start making it slightly more difficult. 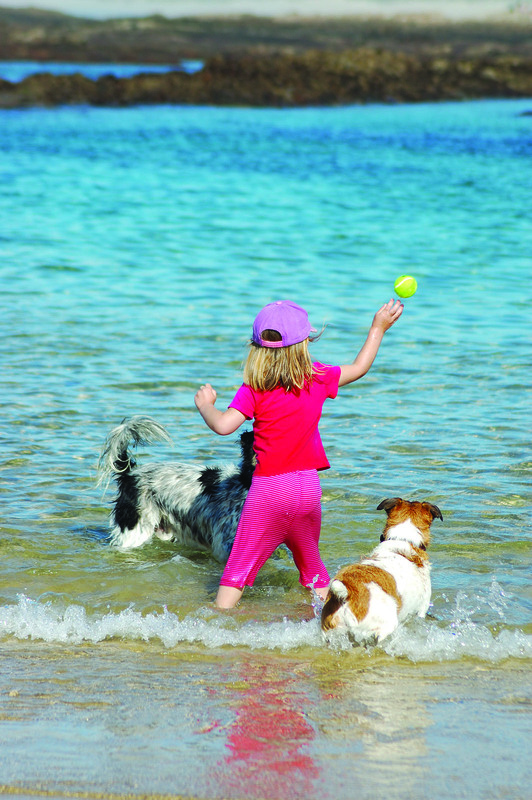 Playing “catch” with the right sized ball can also be fun for both the kid and the dog. (Make sure the dog can’t swallow the ball, and that it fits his mouth. Not too big where he can’t get his mouth around it, but not so small that it can go down his throat and suffocate him.) Start out by bouncing the ball to the dog, encouraging him to catch it. Bounce it just enough to get the ball to him, but not over his head or at his knees. Once he gets the idea, the person bouncing the ball can move further away. This skill can also be used to catch rope toys, squeaky toys and even treats! With some patience, the dog could be trained to catch the toy and put it in a kid sized basketball hoop, box or toy chest. Then of course, there are lots of different tricks that the kids can teach their dogs, such as walking between their legs, balancing a treat on their nose or paws, roll over, shake hands, high fives, crawling, turning around in a circle, sitting up in a begging position, walking on their hind legs, etc. These are limited only by the kid’s imagination and the willingness of the dog to perform them. Most can be trained by using tasty soft, bite-sized treats and slowly luring the dog to do the action that is requested. Using lots of patience and one-on-one training time, most dogs can learn these tricks and many more. As a useful tip, break down the trick into several smaller sections, teach the dog each one of them, than slowly put them together. For example, to roll over, maybe start with getting the dog to lie down on its tummy, then its side, than on its back, than encourage it to roll over. This can be done by moving the treat down and out in front of the dog, especially if he’s sitting, then start moving the treat over his shoulder to have him lay on his side, then continue moving the treat in the direction his nose needs to go in order for his body to go in the right direction. Take it by small steps until the dog understands each one individually, then start putting the pieces together slowly, making sure the dog understands and does each part well before moving on and making it more difficult for him. Soon he’ll know what you are asking of him and may offer the action before you even ask! Another tip, don’t give the trick a name or command until the dog is reliably performing it with just the bait. Once he is readily trying to complete what you want, you can start adding the command that you have chosen for the action. This entry was posted in FAMILY DOGS and tagged children and dogs, children training their dogs, games for kids and dogs, kids and dog training, kids and dogs, kids and dogs and games, pet tricks. Bookmark the permalink. « The Shiba Inu — Right Dog Breed for You?